Since its first publication more than eighty years ago, The Decline of the West has ranked as one of the most widely read and talked about books of our time. A sweeping account of Western culture by a historian of legendary intellect, it is an astonishingly informed, forcefully eloquent, thrillingly controversial work that advances a world view based on the cyclical rise and fall of civilizations. 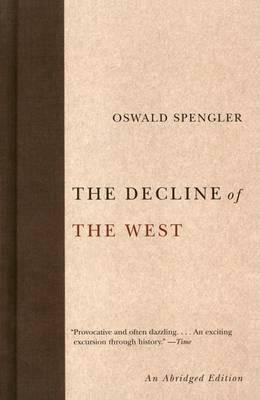 This abridgment presents the most significant of Oswald Spengler's arguments, linked by illuminating explanatory passages. It makes available in one volume a masterpiece of grand-scale history and far-reaching prophesy that remains essential reading for anyone interested in the factors that determine the course of civilizations. "Provocative and often dazzling. . . . An exciting excursion through history." -Time "Audacious, profound . . . exciting and magnificent." "With monumental learning . . . Spengler surveys man's cosmic march. . . . Always forceful . . . eloquent." Oswald Spengler, one of the most controversial historians of the twentieth century, was born in Blankenburg, Germany, in 1880. He studied mathematics, philosophy, and history in Munich and Berlin. Except for his doctor's thesis on Heraclitus, he published nothing before the first volume of The Decline of the West, which appeared when he was thirty-eight. The Agadir crisis of 1911 provided the immediate incentive for his exhaustive investigations of the background and origins of our civilization. Spengler chose his main title in 1912, finished a draft of the first volume two years later, and published it in 1918. The second, concluding volume was published in 1922. The Decline of the West was first published in this country in 1926 (Vol. 1) and 1928 (Vol. 2); this abridged edition was first published here in 1962. For many years Spengler lived quietly in his home in Munich, thinking, writing, and pursuing his hobbies-collecting pictures and primitive weapons, listening to Beethoven quartets, and reading the comedies of Shakespeare and Molière. He took occasional trips to the Harz Mountains and to Italy. In 1936, three weeks before his fifty-sixth birthday, he died in Munich of a heart attack.